Now, I’m no proponent of over-indulging a child. Where I come from, a mylar balloon, a carton of Capri-Suns from Costco, and some lawn darts make for a fine, fine birthday. On occasion, however, I can forgive the excesses of exuberant parenting. Especially when it means pretty picture fodder for this here blog. 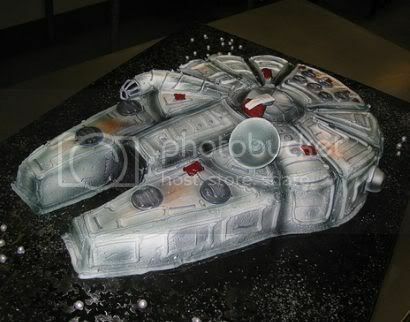 A mom who obviously understands a boy’s natural desire to consume everything Star Wars commissioned Debbie of Debbie Does Cakes to create the Millennium Falcon cake for her son’s eighth birthday. Apparently, this cake followed the little boy’s previous year’s birthday cake of a giant Yoda face, complete with green cake inside. His eighth birthday party also had a standup of Darth Vader greeting people at the door, and guests dressed in costumes for the Star Wars theme. I like the way this kid thinks. It almost gives me hope for the youth of America. The Millennium Falcon cake featured sour cream devils food cake with a vanilla buttercream filling. (Wow. Tastiest. Spaceship. Ever.) Debbie crafted the satellite dish out of fondant and applied those sweet details to the ‘paint job’ with an airbrush. Debbie’s a prolific (“hundreds of cakes a year”) cake artisan based here in the San Francisco Bay Area. Some of you might know her as the lady who made the iconic Macbook laptop cake for Diggnation’s 100th episode celebration, and who created the iPhone cake for Apple’s iPhone development team. Check out her Flickr stream for more photos of her jaw-dropping designs, or visit the Debbie Does Cakes Web site. Thanks for sharing, Debbie! We, the geeky, salute you! Almost makes me wish I lived in CA. Almost. Oh, and I’ve been meaning to say, love the Super Geek costume on your shark. Makes the blog just that little bit more classy. But you KNOW what Edna says about CAPES. Thanks, Karen, I’m pretty thrilled with the new mascot Lauren Monardo made for the site. And, no, I don’t know what Edna says about cakes. Anyway, I thought Edna was dead. This is awesome, as always. Do you think you could find any pictures of star wars themed meat products? Like a Jabba the Hut meatloaf man or something? That would be cool. Just amazing. I’m so jealous of this eight-year-old kid.